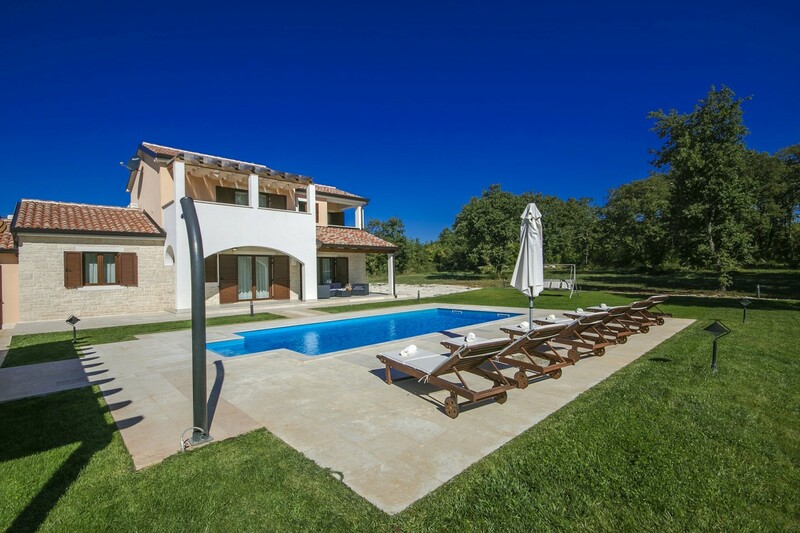 The Villa Genia 2 is a lovely newly built rustic villa which is located on its secluded ground by an oak forest near the village of Katun, approx 12 kilometers from Porec and its beaches. The house was built in the year 2013, and has hosted ist first guests in the summer 2014. It is situated in a garden of 1000 sqm. At the partially fenced plot with maintained lawn, the guests of the Villa Genia have access to private parking for three vehicles, outdoor pool of 32 sqm with sun loungers, outdoor shower, a spacious covered terrace with garden furniture and a barbeque. A covered terrace connects the villa Genia with an identical house that which also has a private garden and swimming pool and which garden is devided by a wall. The home owner does not live on the property. Villa with pool for 8 persons with a total living area of 170 sqm on two floors. On the ground floor is a kitchen, dining room with the access to the terrace, living room with fireplace and satellite TV also with access to the terrace, one double room with double bed, shower/toilet, one more double bedroom with double bed, shower/toilet and separate entrance. On the first floor there are two double bedrooms, one with a double bed and a bathroom/toilet with whirlpool bath, air conditioning and a spacious terrace, and one two-persons bedroom with two single beds, air conditioning, shower/toilet and a smaller terrace.